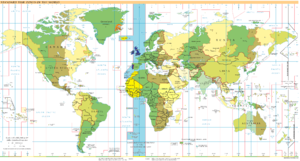 Coordinatit Universal Time (UTC), the basis for the warld's ceevil time. Wastren European Time (Portugal, UK an Ireland). The wasternmost pynt whaur UTC wi DST is applied is El Hierro, Canary Islands, Spain (18°00' W). Time uised thare is 2 oors an 12 minutes ahead o pheesical time in the simmer, makin for the greatest discrepancy in the UTC time zone. The eastrenmost settlement whaur UTC wi DST is applied is Lowestoft in Suffolk, East Anglia, Ingland (at juist 1°45' E). Note that the Republic o Ireland uises the term "staundart time" in reference tae the simmer months an "winter time" during whit the rest o the time zone caws "staundart time". This is the reverse o the practice o maist kintras in the EU, but provides the same end results. The wastrenmaist pynt whaur UTC wi no DST is applied is Bjargtangar, at the northwast peninsula o Iceland (24°32' W). Time uised thare is 1 oor an 38 minutes ahead o pheesical time. This is the greatest deviation frae pheesical time for UTC wi no DST. The eastrenmaist locale whaur UTC wi no DST is applied is Bouvet Island, o Norwegian jurisdiction, at the Sooth Atlantic Ocean (3°24' E). This page wis last eeditit on 29 Januar 2014, at 00:24.